​Note: GDP change in the model is equal to changes in value added plus changes in tax. Because the model only details changes in value added at the industry level, the above Figures add the national change in tax to each industry. Also, “All Other Industries” includes Canadian industries that account for less than 0.5 percent of National GDP. After recent threats by the Trump Administration to withdraw from NAFTA, along with the implementation of new duties on Canadian softwood lumber, many fear increased barriers to bilateral trade. How should Canada react? 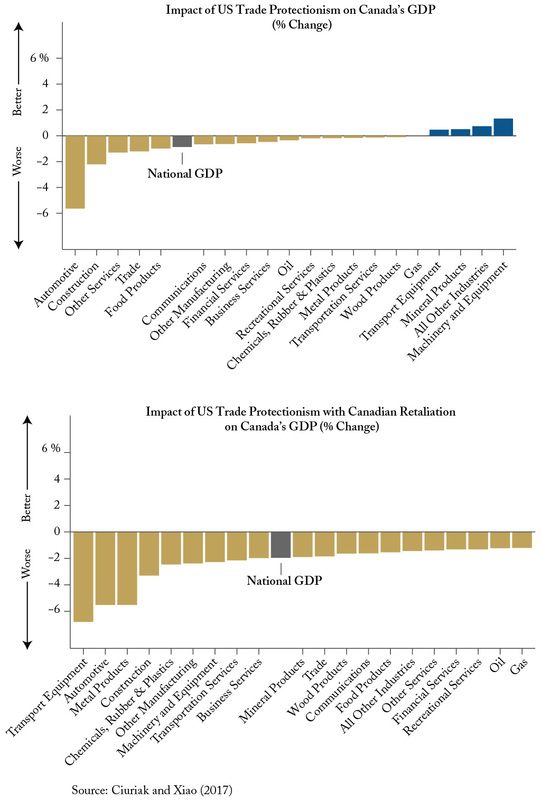 In this edition of Graphic Intelligence, we look at two scenarios: 1) The potential impact of increased US trade protectionism on Canadian industry from a 10 percent tariff similar to the 1971 Nixon surcharge, but imposed on all goods and services from trading partners; and 2) the economic impact of Canadian retaliation, where Canada implements a similar 10 percent tariff on US goods and services. In the first scenario, the bulk of Canadian industries, with some exceptions, see reductions in their contribution to GDP. This translates to a retraction of National GDP by 0.9 percent. But why would some Canadian industries be better off from a US surcharge? This is explained by the fact that some industries, such as machinery and equipment, see their Canadian market shares increase as their US counterparts fill in the US market slack from reduced imports. In the second scenario, if Canada were to retaliate with a similar tariff, we see that all industries would be worse off, and that national GDP would fall by 2 percent. While it may seem that Canada is passively waiting to see whether our southern neighbour will increase trade barriers, one aspect that Canada does have control over is resisting retaliation that would simply exacerbate the impact of trade protectionism on the Canadian economy. To read more about US protectionism and Canadian retaliation, check out "Protectionism and Retaliation", by Dan Curiak and Jingliang Xiao. Aaron Jacobs and Vincent Thivierge are Researchers at the C.D. Howe Institute.